"If the new Winnipeg franchise proves to be successful, then because of revenue sharing the NHL has, Winnipeg will be helping to pay for the Phoenix Coyotes." 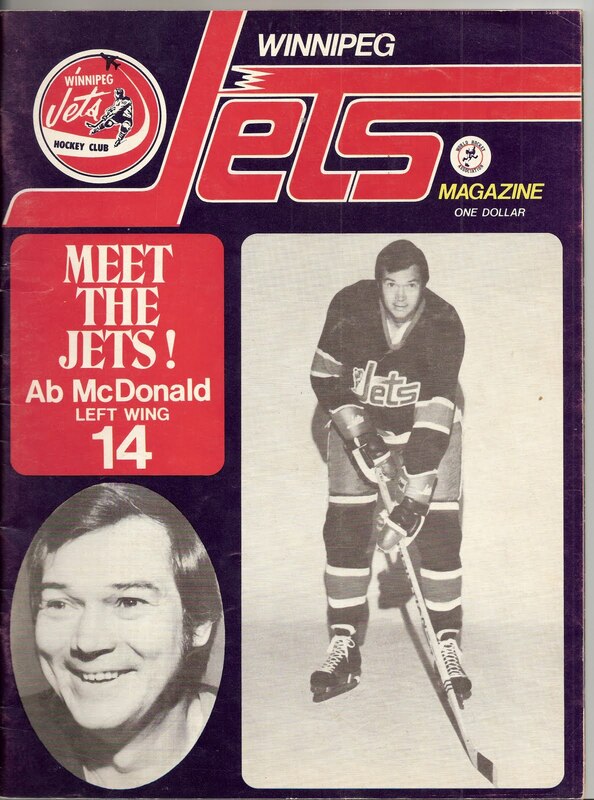 Welcome back, major league hockey ! We are the oldest and second largest shelter in Winnipeg, Canada for women and children fleeing domestic violence. Courageous women and children, who rely on us to build a new life free from violence, need your help. – donate gifts-in-kind of goods or service. For more information, call Joy - (204) 942-7373 ext. 240 and Google my name (Barbara Judt, Winnipeg) to see the great work we do here. Let’s rock this event together and send a message to the brave women and children fleeing violence in their homes that we believe in them. 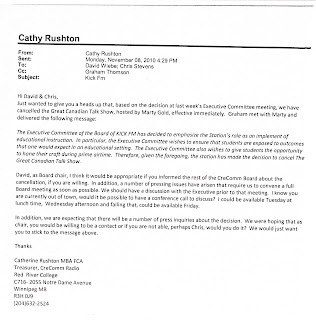 Executive Director, Osborne House Inc.
Notes obtained from Red River College through access to information laws, reveal that repeated claims the so-called 'Executive Committee" held a formal meeting on November 2nd about Kick-FM programming or The Great Canadian Talk Show are false. RRC Creative Communications department chairman Larry Partap serves as Secretary on the Board of the non-profit radio licencee, Cre-Comm Inc. A FIPPA application forced him to turn over handwritten notes about an urgent meeting held by Partap and RRC Dean of Business Graham Thomson with station manager Rick Baverstock on November 4th. It was exactly 2 weeks after Thomson assured RRC President Stephanie Forsyth that TGCTS could be knocked off the air "without too much trouble ... through a chat with Rick". Although Thomson told the National Post in a November 17 story that a meeting of the "Executive Committee" took place on Nov 2nd, "where four voting board members unanimously decided to cancel Mr. Gold's show ... but without any outside influences", Partap's handwritten notes about the discussion with Baverstock tell a different story, and that it was indeed trouble for Forsyth's agents to convince Baverstock to play along with their censorship game. Partap's notes, entitled "Mtg w Rick & Graham Nov 4th/2010" shows a couple of unrelated financial matters were discussed, before Partap turned to the "Nomination mtg with Chris Stevens & David Wiebe". That was a different committee of the station which had no possible authorization from the Board to discuss programming -- or make policy decisions about anything other than finding candidates for Board membership at the upcoming AGM. The Nomination Committee consisted of Wiebe of Golden West Radio, Stevens of CHUM Radio Ltd., Partap, and College vice-president Cathy Rushton, who had previously told Partap and Thomson the falsehood that Mayor Sam Katz had complained about Marty Gold to former College president Dr. Jeff Zabudsky. It also included a fifth member, former CHUM executive Bryan Stone, who was absent. - The four members who attended the Nomination Committee meeting are also, allegedly, the members of a mysterious, undocumented committee of the Board called the "Executive Committee". - There is no record a meeting of that Committee was ever called or held on November 2nd, although those 4 members met for a different purpose that day. - No minutes of an Executive Committee meeting on November 2nd have ever been produced, despite the legal requirement to turn them over under the Freedom of Information legislation. - Four people bumping into each other in an elevator would not constitute a formal meeting of any committee those people belong to. - Four people meeting for one specific purpose, cannot transmute that gathering into a meeting of a completely different Committee on a completely different issue, without due notice that a meeting has been called. - Furthermore, the Board was never informed of this alleged meeting, contrary to their own declared process. There is not a word about Marty Gold recorded in the minutes of that Nomination Committee meeting. But 2 days after, station manager Baverstock was informed The Great Canadian Talk Show was being targeted. It wasn't the chairman of Cre-Comm Inc who met with Baverstock, it was 2 representatives of Red River College, including Graham Thomson, who internal documents proved was informed that President Forsyth wanted the show deep-sixed, and Larry Partap, who parroted Forsyth's reasoning. and then, the real reason for silencing the show slipped out of his pen. "Marty - mainstream media bashed; we offend the very community we serve". Who is the "we" Partap refers to? He was speaking as a representative of Red River College, and not as an officer of Cre- Comm Inc, which had never received a formal complaint about the show from anybody. 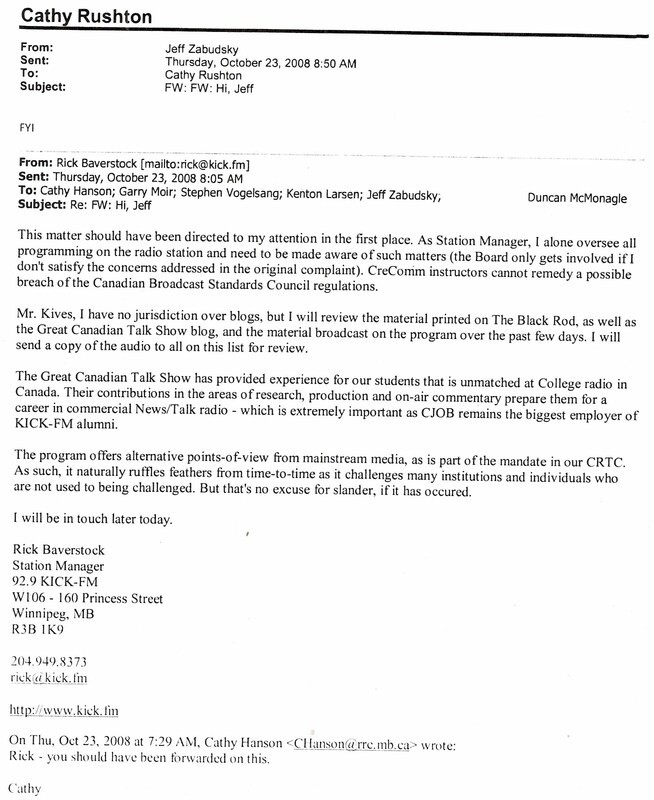 - His notes itemize the station manager's defence of TGTCS, including that students were already heard on prime time within the format, which he had lauded to Free Press reporter Bartley Kives as "unmatched" in the country; and that "Rick spoke to Marty about 1 year ago" and no formal complaints were ever filed before or afterwards. "How much money does Marty make from this"
"Marty gets a "lot of attention" - is this our mandate?" Thomson, as Dean of Business, had been on the Board since its inception. One would think he would have known the station mandate under the CRTC regulation by November. - Days later the College helped invent a meeting of the mythical "Executive Committee". An hour after TGCTS was axed, the College's vice-president of Finance tried to create a record of that fateful meeting that was otherwise undocumented - and which you can now see, never actually took place. 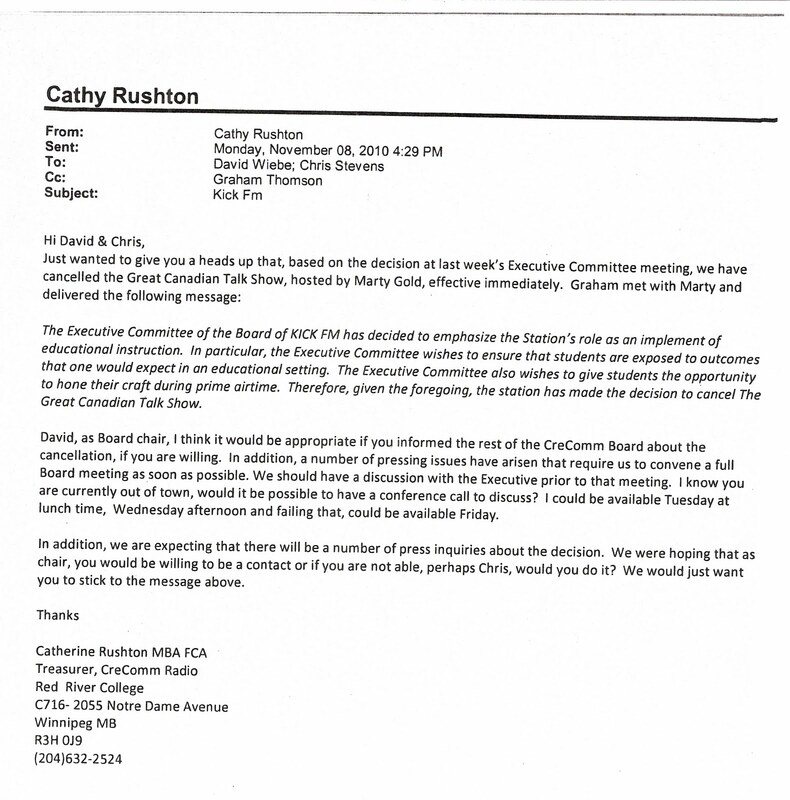 "Dear David and Chris" wrote RRC vice-president Rushton to the two radio executives "... based on the decision at last week's Executive Committee meeting, we have canceled The Great Canadian Talk Show, hosted by Marty Gold, effective immediately." That would be the "decision" made at a formal meeting of the "Executive Committee" that did not happen, and for which there are no known minutes. She then provided a copy of the now -discredited cover story that had been read out loud to Gold and Baverstock by Graham Thomson an hour earlier, beseeched Wiebe to handle media inquiries, and added "We just want you to stick to the message above." Once again, the question has to be asked, who is "we" ? - It may surprise readers to learn that Red River College has a strict ethics policy (under P Series). Despite numerous complaints from Kick-FM listeners that they, the National Post, and other media were deliberately misled about the mysterious "Executive Committee" and the actual reason for the TGCTS being eliminated, College officials have not commenced a single investigation into the written complaints about alleged ethical breaches and questionable conduct of the Dean of Business, Graham Thomson. Next: How the CRTC defines "the community that campus radio serves" may surprise the "Executive Committee" and Stephanie Forsyth. Alas, the efforts by Newcap to make radio listeners forget the abandonment of country-themed Hank-FM and embrace K-Rock as a classic rock option are at an end, as the Newfoundland Capital Corporation Limited has sold both K-Rock 100.7 and the multi-cultural formatted CKJS (810 AM) to Dufferin Communications Inc., a subsidiary of the Evanov Radio Group. This summer Evanov is going to launch the almost-forgotten CFJL 106.1 licence awarded by the CRTC a couple of years ago, and hopes for CRTC approval of the take-over of the other 2 stations to be approved by years' end. This marks their first foray into the West, bringing the chain to a total of 15 frequencies. More posts in the works about local radio, city hall and the Manitoba legislature. Enjoy the long weekend ! 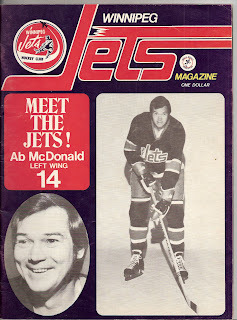 2) ... after Bateman switched from the Liberals. She had not built a party base, so how dedicated was the Winnipeg South CPC constituency team to run a short campaign and knock off the "Liberal heavyweight" (CBC's label) ? 4) Bateman added 1365 votes to the Tory ledger over the vote count of Trevor Kennard last time out. Her margin might well have been there were 150 Liberal families that rejected Iggy and went blue with Bateman, with another 1000 people who hadn't voted last time ... You get the point. Bateman's win was the result of hard work and appealing past the Conservative base no matter how you cut it. But there was one other factor. Nelly Gonzalez: ... we know that Anita Neville is...is...we know there's a mystery candidate that hasn't been announced yet, if it's going to be Joyce Bateman or other names. Nelly Gonzalez: What do you know about that and what do you think the chances are for the party to, uh, regain that seat, Winnipeg Centre...North. Shelly Glover: "Well, Anita Neville is in trouble. I've only been in Parliament for two-and-a-half years, Nellie, and I'll tell ya, there are a lot of shenanigans going on in Parliament. We need some ... some fresh blood. We need some new people who come with new ideas and who are willing to stand up for their constituents." No one mentioned tonight, that it looks like Shelly Glover was right all along.